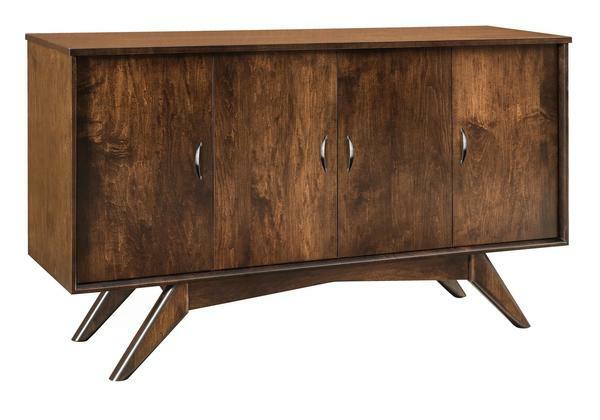 The simple lines of the Amish West Newton Buffet contribute to an exceptional contemporary style for dining room, living room or den. Squared and clean, with four solid wood doors and slanted legs creating interest, this solid wood buffet is a shining jewel for storage and for serving. While buffets originally only had a place in the dining room for serving and storage, they have branched out and are used interchangeably as lovely hallway or foyer tables. Custom furniture from DutchCrafters comes with assistance. Our team of Furniture Specialists is ready to serve you from start to finish. Please email or call with any concerns from build time to shipping and we will help you out. Thank you for taking the time to shop with DutchCrafters.